Emergency vehicles stage near the site of another explosion Tuesday in Austin, Texas. On Tuesday, a bomb inside a package exploded around 1 a.m. as it passed along a conveyor belt at a FedEx shipping center in Schertz, northeast of San Antonio and about 60 miles southwest of Austin. One worker reported ringing in her ears and was treated at the scene. 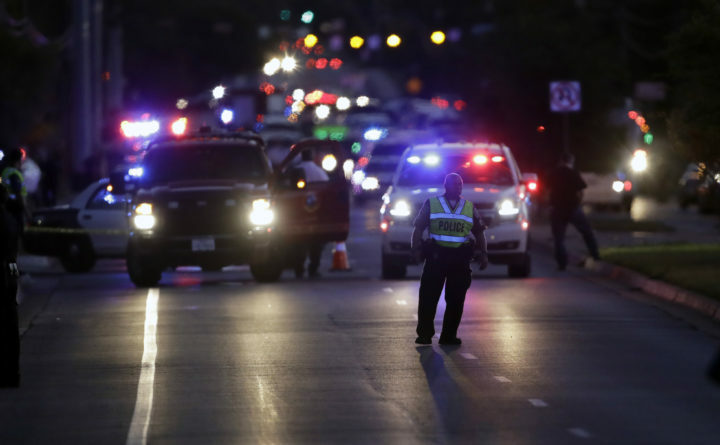 The Schertz blast came two days after a bombing wounded two men Sunday night in a quiet Austin neighborhood about 3 miles from the FedEx store. It was triggered by a nearly invisible tripwire, suggesting a “higher level of sophistication” than agents saw in three package bombs previously left on doorsteps, Milanowski said. Associated Press writers Will Weissert, Paul J. Weber, Sadie Gurman and Tim Jacobs contributed to this report.